The following words are the story written using the diary style filled with notes and comments all along the operation. I’m gonna try to tell you the marvelous adventure of 3B7A on the island “île du Sud” on the archipelago of St Brandon through my memories and my feelings. 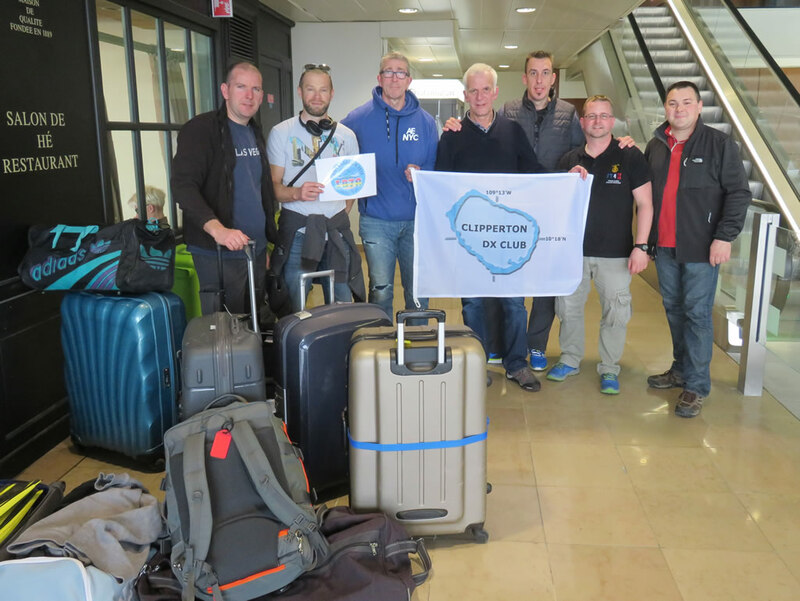 After the undeniable success of FT4TA Tromelin 2014, FT4JA Juan de Nova 2016, the team decided to start another challenge. All this formidable operation was controlled to perfection by Sebastien F5UFX and Florent F5CWU, and profited from the proven experience of Vincent F4BKV. Michel F6AGM advised us on the basis of his experience of 3B7C in 2007. We are the Sunday April 1st 2018. The team meets at the Orly airport in Paris. In spite of some transport difficulties which could have complicated our schedule, everyone arrives in the afternoon, smiling, ready to leave for new adventures ! 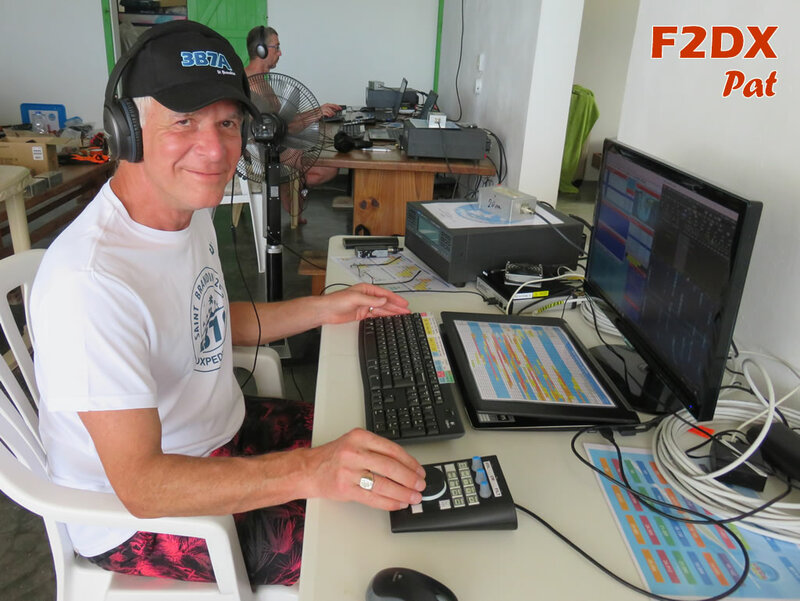 Patrick F2DX introduces us Jean-Baptiste F8DQL who nicely offers his help to maintain the website up to date during our absence. Laurent F8ATM, our new “Rookie” joined the team and everyone welcome him warmly ! After a last checklist before departure, we spread all equipments into the different suitcases to avoid extra-fees with luggages. The most fragile equipment has been kept in the carry-on bags. 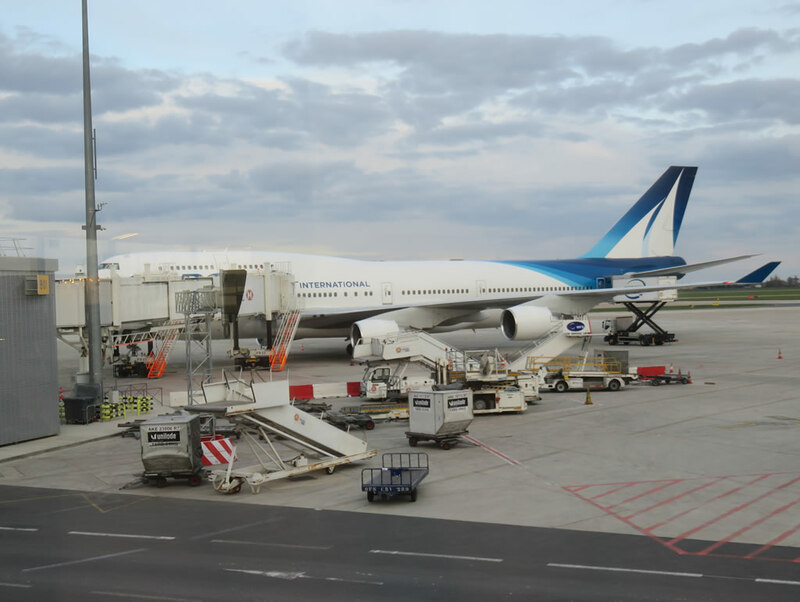 The boarding starts on time for the pleasure of the team. See you later from the Indian Ocean! Once installed in our seats, a long wait starts. Without any announcement for a long time, the atmosphere becomes tense. Mechanical problems on the plane are finally confirmed but could not be fixed by the technicians immediatly. The crew informs us of the cancellation of the flight and asks us to leave. It will be finally deferred to the following day evening. Vincent F4BKV, flew directly of Barcelona a few days earlier. He is already in Mauritius after a short visit to Rodrigues (3B9) during the week-end. In our side, we slept in a hotel nearby the terminal. 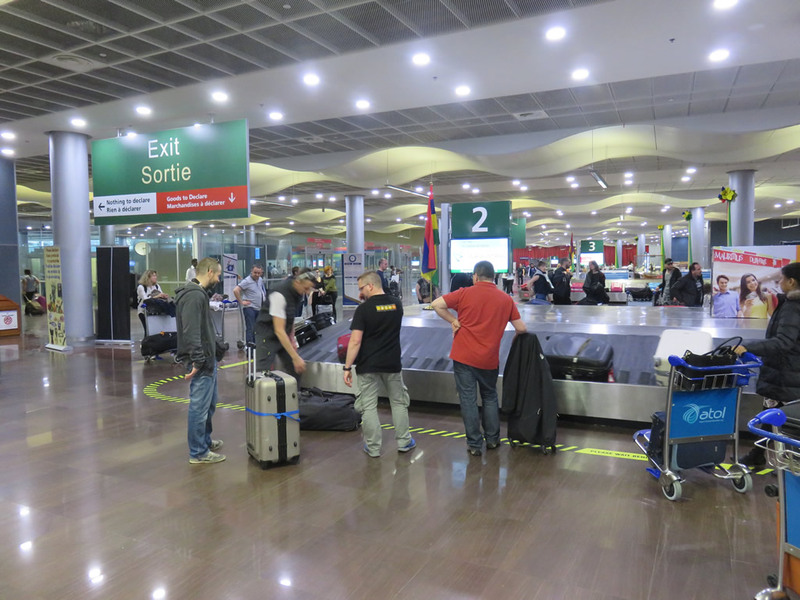 After a short night, we are back to the airport to take our flights, a first leg toward Réunion (FR), then a second flight to Mauritius. With this hitch of 24 hours, the schedule is tightened, the pressure goes up, but the moral of the team is excellent. With relief, the plane takes off around 18h00 toward the Indian Ocean. While pleasant thoughts towards our families emerge, our eyes are rivetted on the screens . Some interrogations remain as well as crucial points to be treated before the departure of the first boat… but tiredness finally wins… Cape in the direction of the archipelago of Mascareignes, formerly “Isle de France”, more commonly called “Moris” by the Creole or “Mauritius” after the English colonization. We arrive at the island of Réunion for a stopover. The sight since the sky is blocked by the clouds and does not let to us contemplate the splendid mountains. We then undergo a second flight posponement which obliges us to quickly reorganize some logistic points with Vincent F4BKV by telephone. 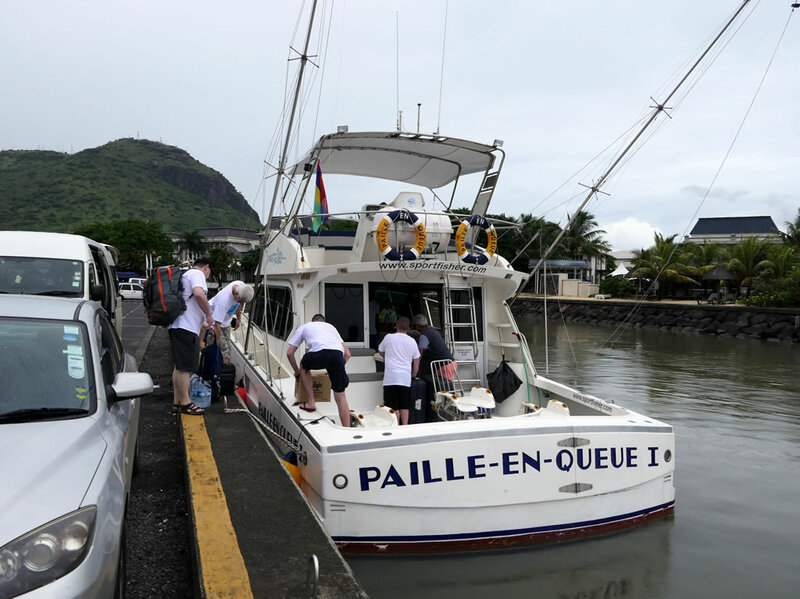 Thanks to its reactivity and the help of a Mauritian friend, we remotely organize our transfer from the airport towards the harbor area as well as the purchase of some necessary equipment for the good success of the expedition. 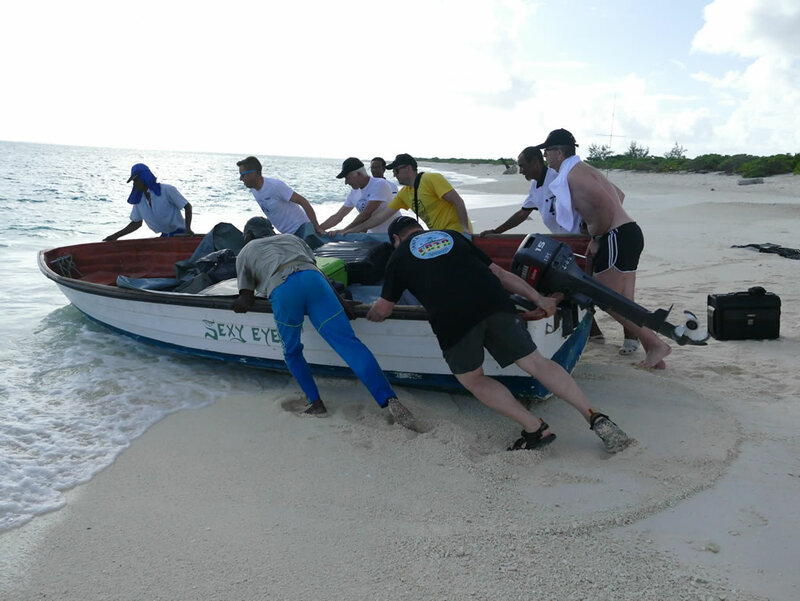 Our flexibility being thus reduced to nothing, Florent F5CWU and Pascal F5PTM embark immediately on one of the fishing boats of the “Raphaël Fishing Company”. They carry with them food, water, fuel, an amazing quantity of ice for the future peaches of the crew, but also our crates of equipment sent several weeks before.Each one was unpacked and each part of the puzzle pointed once again and checked to be certain that nothing misses or is not damaged. Which formidable work upstream of Florent F5CWU on the logistic points, assisted for the administrative points by Patrick F2DX. Many problems were met and managed throughout the months of preparation, but their obstinacy makes all their efforts worthwhile. 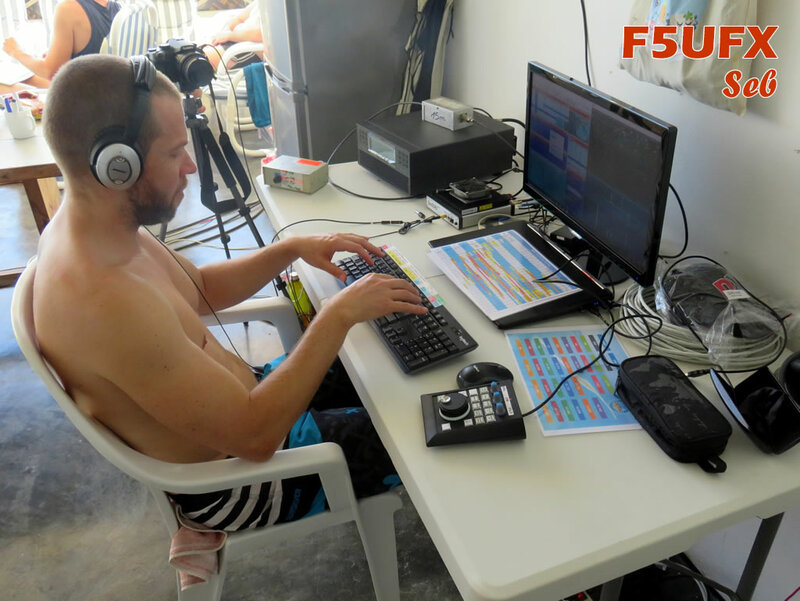 The other tasks were distributed between the various members of the team, the whole orchestrated by our leader Sebastien F5UFX. 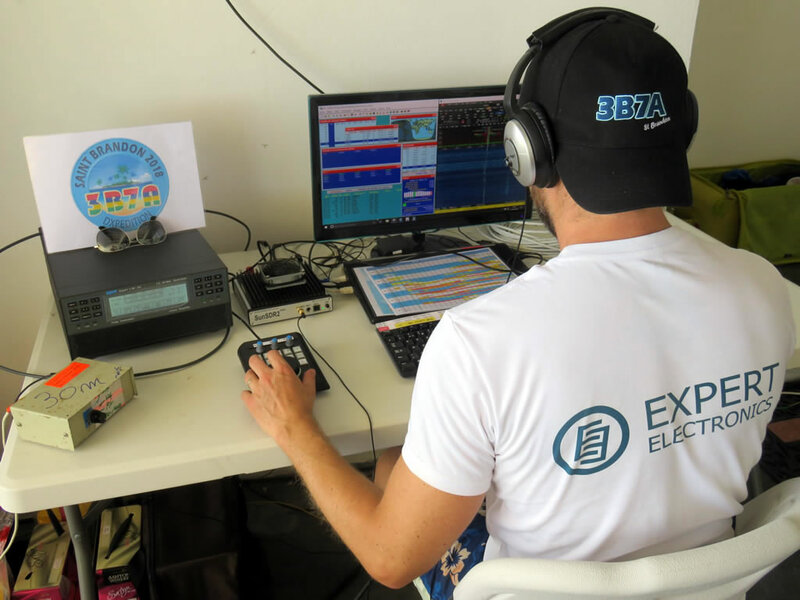 All the members of the team implied themselves in the test and the configuration of the stations, in particular the TRX SunSDR2 PRO during several weeks. A 100% SDR expedition, the bet is dared, however we had already many positive feedbacks (including our own from FT4JA). We also tested our secondary equipments such as our coaxial “Messi & Paolini”, Low Band System bandpass filters, laptops during contests to approve their reliability and to accustom ourselves with their use. Concerning the antennas, we chose once more the 2 elements vertical dipole array built by Vincent F4BKV for high bands, and the usual low bands configuration which showed their efficiency during our last expeditions under similar conditions. Our only large concern was related to electricity. In which state are the rented generators? How were they really maintained and under which conditions they worked ? On the islands, equipment suffers a lot. Unlike FT4JA where we had new generators, tested, approved and maintained by our care, this time we cope with another configuration. Imagine to trust in equipment which is the keystone of all the mission but without any control before the start of the operation… We did not want to take any risk, so we had envisaged several alternative solutions while keeping an eye on our expenditure. As the saying goes: Caution is the mother of safety! Chapter 3: We are ready! 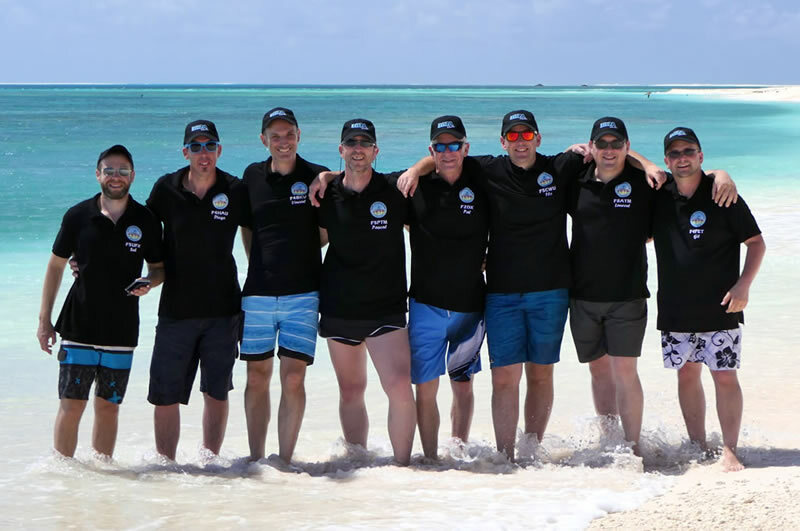 Most of the team members are still in Mauritius. This day starts with several good news ! 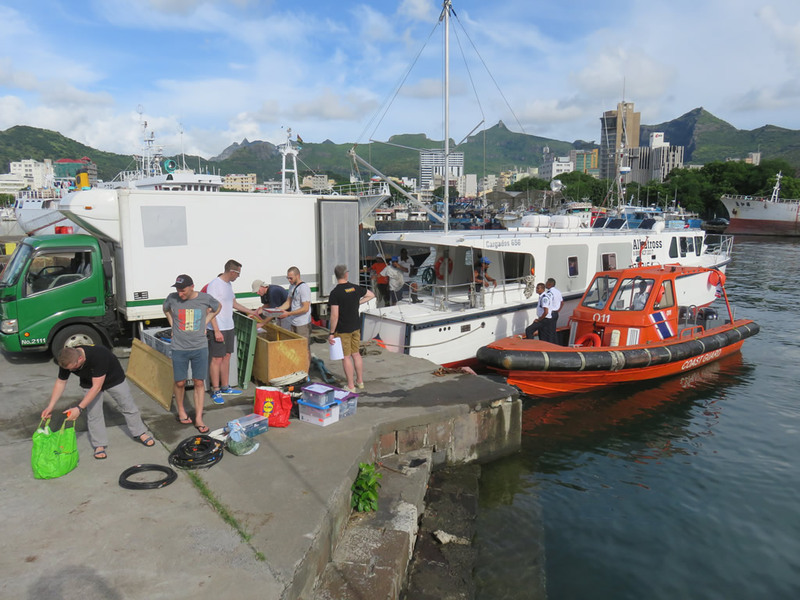 Florent F5CWU and Pascal F5PTM arrived well in the night and went ashore in the morning with all equipment after 26 hours of formed sea.The site is similar to the photographs with which we worked to prepare this expedition. They have been able to check and start the generators. Everything runs smoothly. 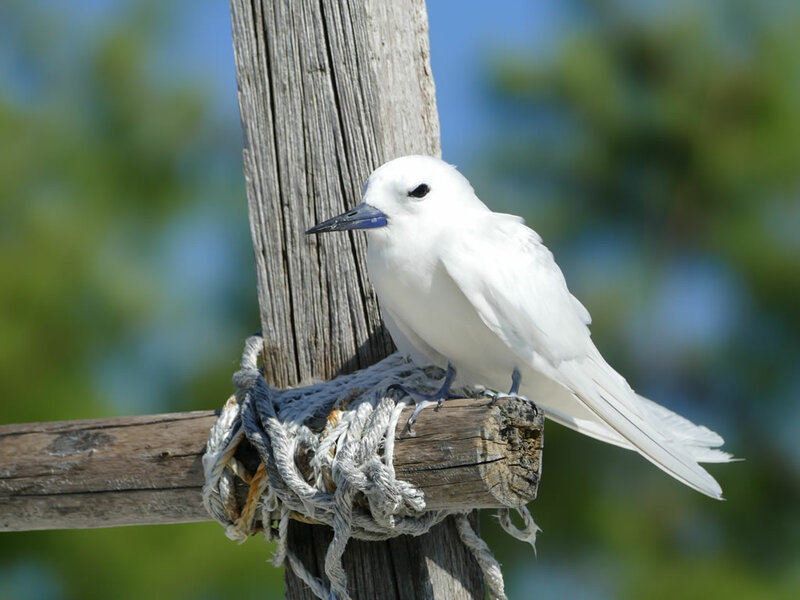 In Port-Louis (3B8), we embark into the “Paille en Queue” (“white tailed”), a name in reference to these splendid birds of the Indian Ocean. This boat is smaller than the first one but well equipped for this kind of journey. 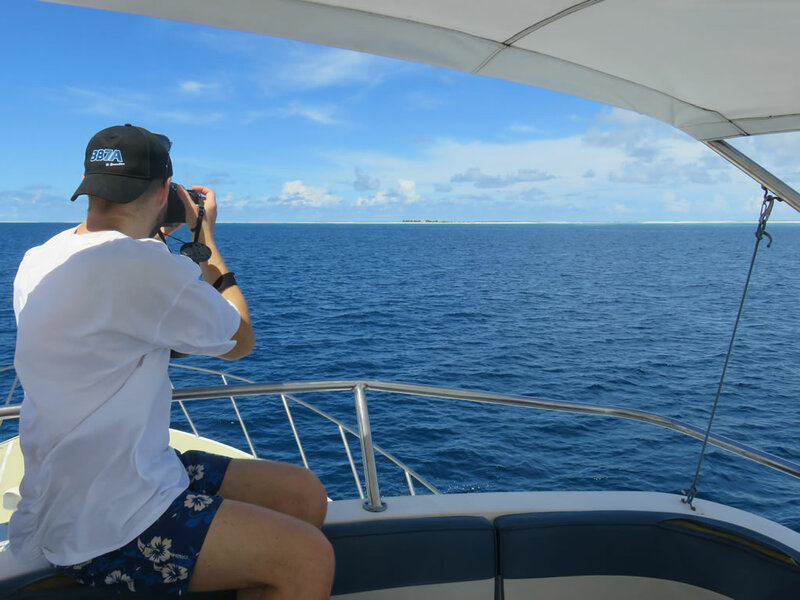 11h30 UTC… after 26 hours of sea, we distinguish the island just above the horizon and the imposing wreck of a boat who sank on the reef. Here we are ! 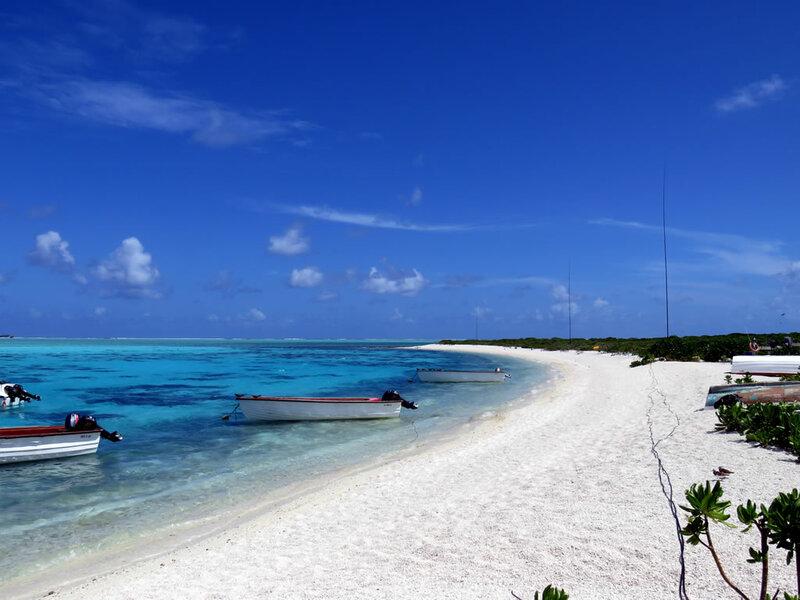 For the great pleasure of the team, the “île du Sud”of the archipelago St Brandon appears above the coral reef where the lagoon radiates with its turquoise blue. 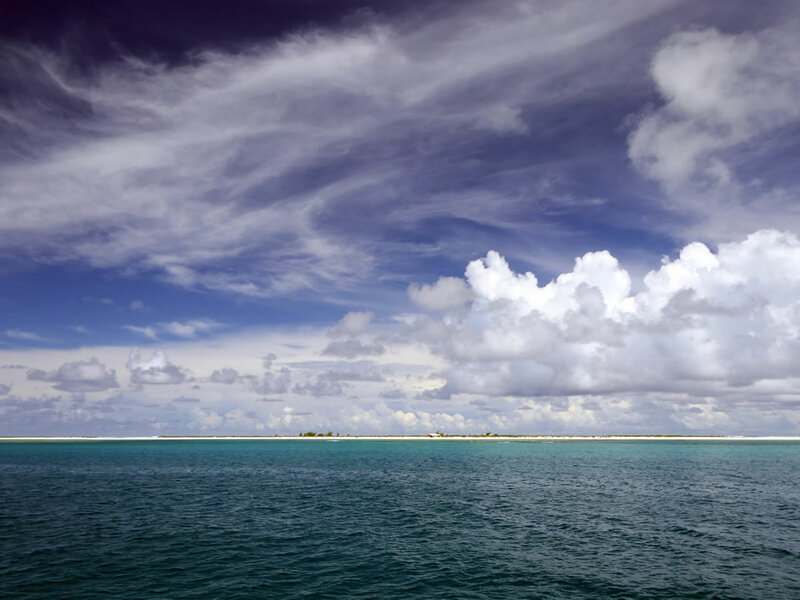 This archipelago is composed of small islands and sand banks; It is also known under the name Cargados Carajos and is located at approximately 420 kms of Mauritius and is managed by “Raphaël Fishing Company” since 2008. The island is rather summary. It is a long sand bank just a few meters above the sea level with many tropical bushes. 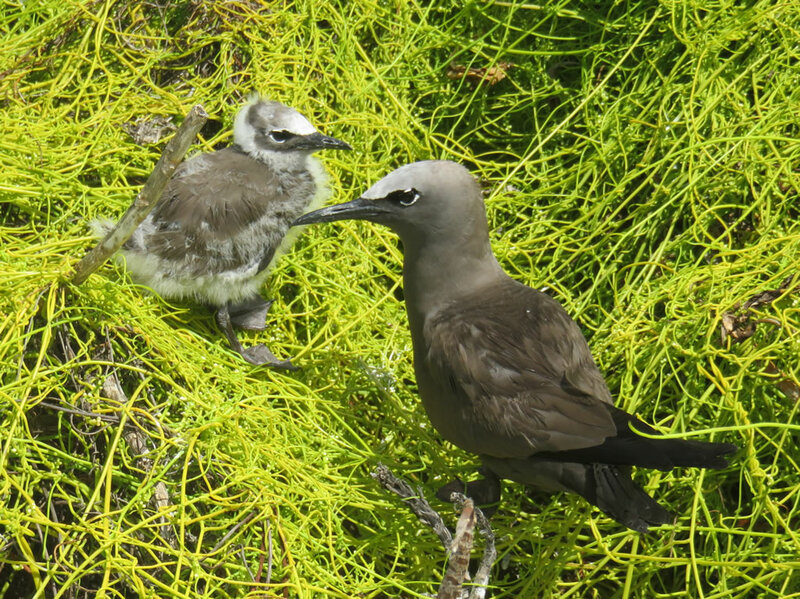 Birds are everywhere, and are nesting at that time of the year. Close to the house of the three coastguards, some palm trees draw up a path. There’s 3 others small concrete building on the islet where the company workers are living. One of them is the guesthouse. This small paradise is a haven of peace for the birds nesting species which come to reproduce there. The main specie is the Gygis Alba with which we coexisted throughout the stay. As usual with our operations, we made our best to minimize our displacements and limit the deployment of equipment in order not to disturb the birds which nest nearby. We did not use certains areas due to the presence of too much birds. Several females brooded even their eggs on the edges of the windows of our small house. Towards the end of the stay, several births took place…. Magic moments! 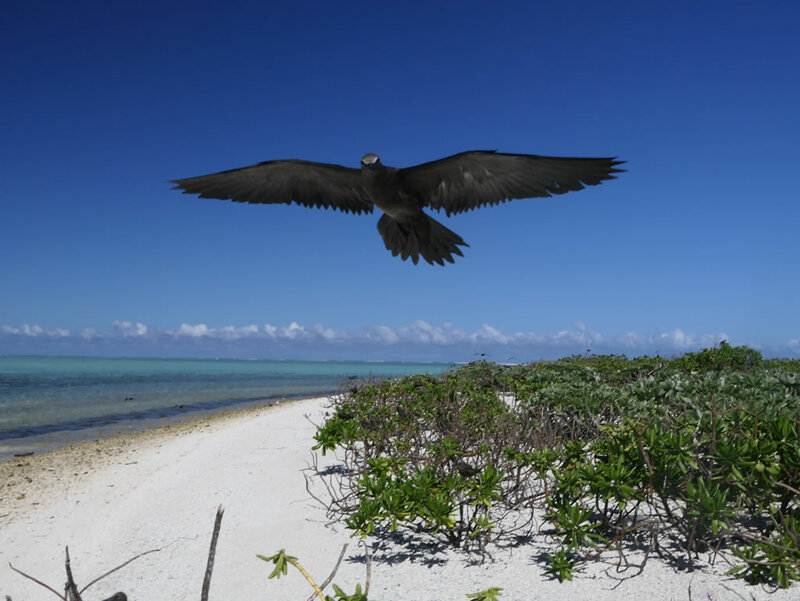 We have to admit that on this archipelago it is the human who is a guest not the birds ! We live temporarily on their territory and consequently we are humble and respectful of the place. RESPECT of the nature is a paramount and fundamental value of our team. R like Respect of the places where we plan to organize our expeditions. We study the feasibility and the impact of our activities. E like Environment to reduce the impact of our presence on the nature and the living organisms. S like Sharing. Before to start a project we exchange a lot with authorities to find proper solutions. We often ask advices to operators who have visited the places in the past. Sharing experiences is very important. P like Professionalism because in spite of term “amateur”, we want to make everything professionaly. E like Educative. All these operations are very interesting due to the differents subjects broached. We have to admit that we had to open books and make researches to present applications to certain administrations, especially about subjects very far from radio. C like Cohabitation because where we go it is very important to coexist with Fauna and Flora. T like Transparency because we transmit all documents or parts necessary to prove our good faith and our codes of conduct. The first QSO is completed on 20m SSB at 19h00 UTC with EA7/OH3ELB.We start also our activity on 17m SSB, 40m CW and 30m RTTY. All operators are smiling as soon as the pile-up intensify. The concentration is maximum in spite of the tiredness and the 30 degrees in the patio. It is 04h00 UTC. 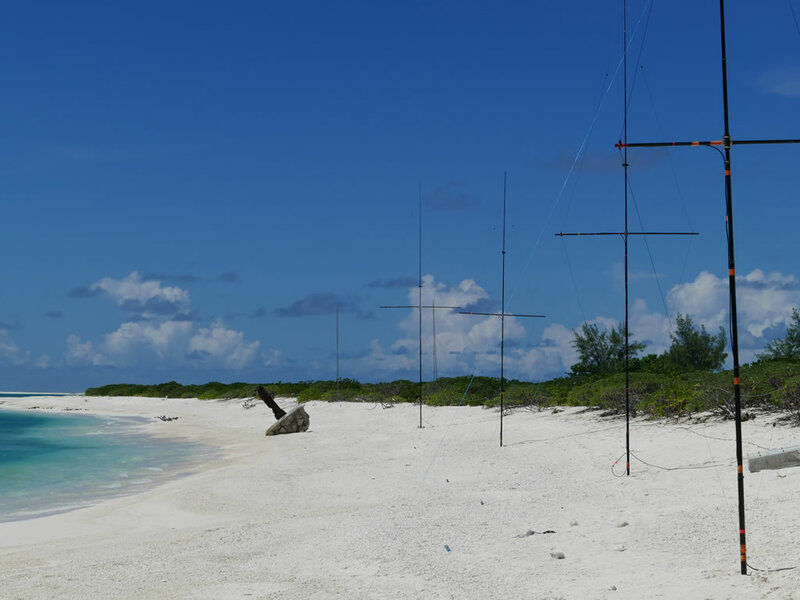 Gil F4FET announces us that the 4-sqaure installed on the beach works like a charm and that propagation with US is great with the sunrise. It is an excellent new! Before the temperatures climb we have to assemble the verticals for 80m and 160m, and to set up the receiving antennas for EU/US and JA. The objective is to start low bands operation the coming evening. The day was excellent in spite of propagation predictions not very positive. At 20h30 UTC, the log shows 9000 QSO. We are very satisfied and encouraged by these results of the first hours. 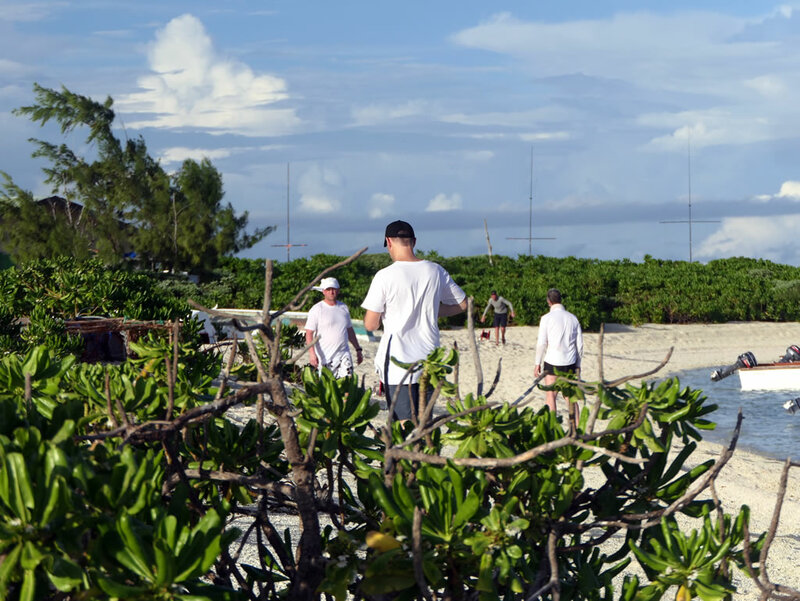 This day is marked by the birthday of Patrick F2DX who celebrates his 60th anniversary with team members on this splendid island, lost in the Indian Ocean. We make a short break to toast with a typical sparkling drink. We take advantage of that off-radio moment to make a debriefing and share the first comments received. Our Chief Pilot Michel F6AGM, gives us important informations using the satellite connections. He is in touch with other pilots and make synthesys of the requests and remarks. This allow us to adjust our schedule. The SunSDR2 PRO works marvelously well (what a powerful product in a small box). The settings chose prior to the expeditions give satisfaction. No one seams disconcerted by this new technologie. The VFO (E-coder) is ludic and gives access to the main functions. The association of the SDR is perfect with our lightweight amplifiers Expert SPE 1.3K whatever the mode of trafic used. The visualization of the pile-up via the spectrum displayed on the laptop is impressive and extremely useful to manage the trafic. We are feeling good and we will give the maximum to fulfill the wishes of the amateur radio community. We observe excellent openings toward Europe and our Japanese friends. Their signals are impressive on the different bands. The trafic is fluid, much more compared to our previous operations, thanks to less call repetitions most of which were not necessary. Great ! The evening, around 17h00 UTC, a short opening toward the US appeared on 17m and 20m. Some of them are very loud ! While some are busy with pile-up, others are trying to improve our RX antennas. A phasing of KD9SV flag has been added this afternoon. Vertical dipoles have been installed to give us the opportunity to work with 2 stations on 20m and 15m which are the most productive bands. We must be present as long as the band is open to give a chance to all, in particular for the most difficult zones. The 80m and the 160m stations are active and log many stations. The propagation on the high bands is in conformity with what we were expecting. In the evening we already logged 15000 qso. The last night was difficult and the conditions on the high bands are far from being identical to the previous days. The North-American stations are very weak. We are conscious of the situation and redouble attention. JA, NA, EU Pile-up are sometimes on the top of the other and the management is time to time a bit complicated. 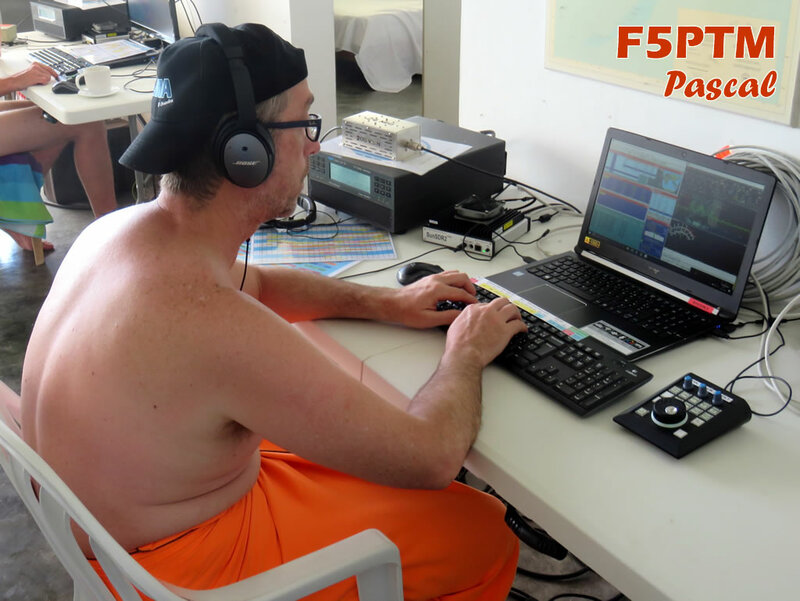 We reach the 25000 QSO by greeting our buddy, Cédric F5UKW, who was our control station during FT4JA. The low bands were productive with all the continents, but we always undergo difficulties on the high bands, particularly on SSB. But do not count on us to throw in the sponge! The conditions evolve positively, in particular on the 10m which was under monitoring. Lastly, we can use it and work many stations on CW and SSB. On the other hand, the 20m and 17m closed prematurely and do not let us the opportunity to exploit them during the night. Tiredness is obviously felt. For one week we have slept only by sequences of a few hours in heat. Undoubtedly the cohesion of the group and the attention of the ones towards the others is omnipresent. 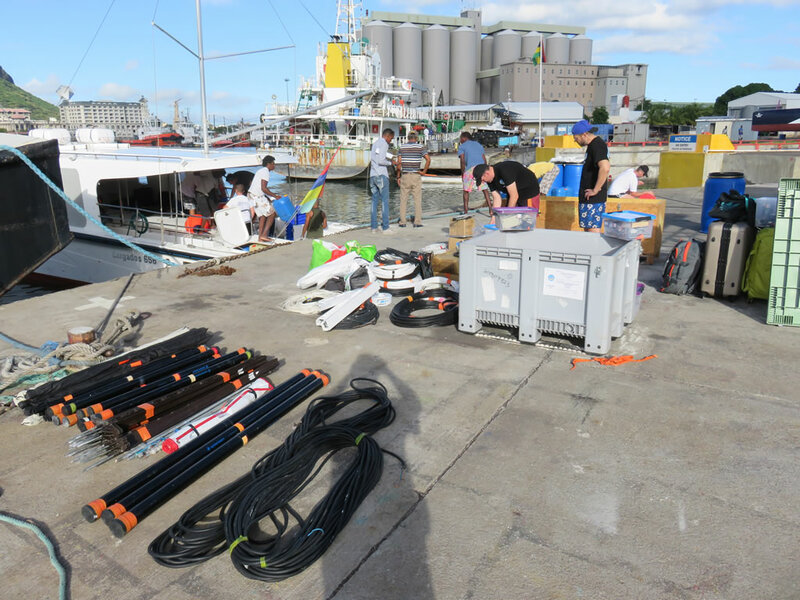 It makes possible to combine relaxed environment and effectiveness during our shifts.The tide of the ocean became suddently stronger.Installed on the beach, we have to check regularly the guying of our masts. Some anchor points have been reinforced. 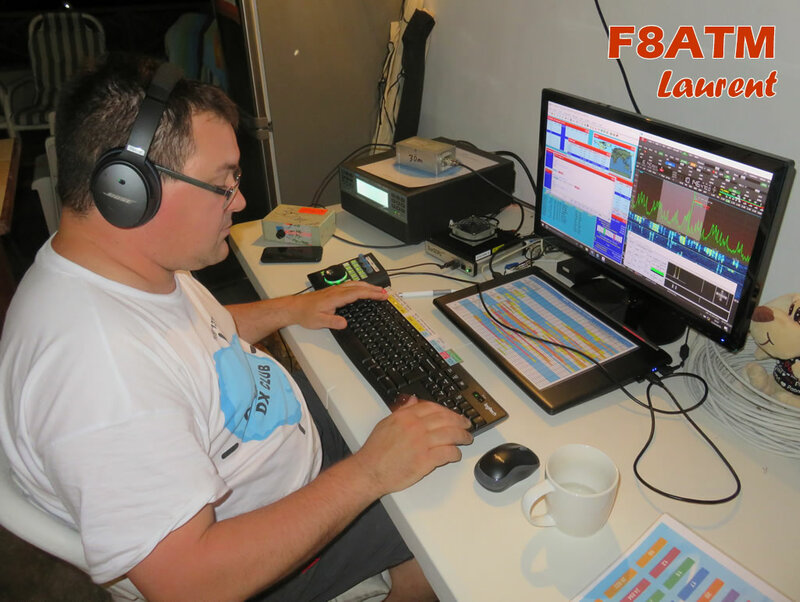 Sebastien F5UFX continuously points out the instructions and the propagation slots whom should not to be missed towards certain areas of the globe. Each station has a document prepared by Pat F2DX whom shows the VOACAP/K6TU predictions. With such informations, we know where to listen. The signals on 80m are weak and the noise level is very high. The 160m stations is close to the 1000 contacts, using a Spiderbeam 18m mast with a wire hat also provided by our friend Cornelius DF4SA. We undergo DQRM, that make the pile-up difficult to control.It is a pity especially when the bands are favourable to offer many ATNO. We can only regret and condemn these behaviors.Throughout the day, Laurent F8ATM and Gil F4FET blacken the logbook in RTTY at a good rate, helped by the spectral visualization of the SDR. This is a real plus ! We approach the 50,000 Qso and it will be necessary to continue the efforts to achieve the goal of 70,000 Qso! The tide is always strong and the waves come up to the steps of our small house. The control of guy anchors becomes more regular to anticipate any problem. The conditions of propagation remain average but the perseverance of the CW operators during the night let us cross the 1000 contacts on the Top Band! The 20m was also prolific with the American stations as well as the 80m in CW/SSB. The 15 and 12m are rather good; strange how from one day to another the conditions of propagation evolve. 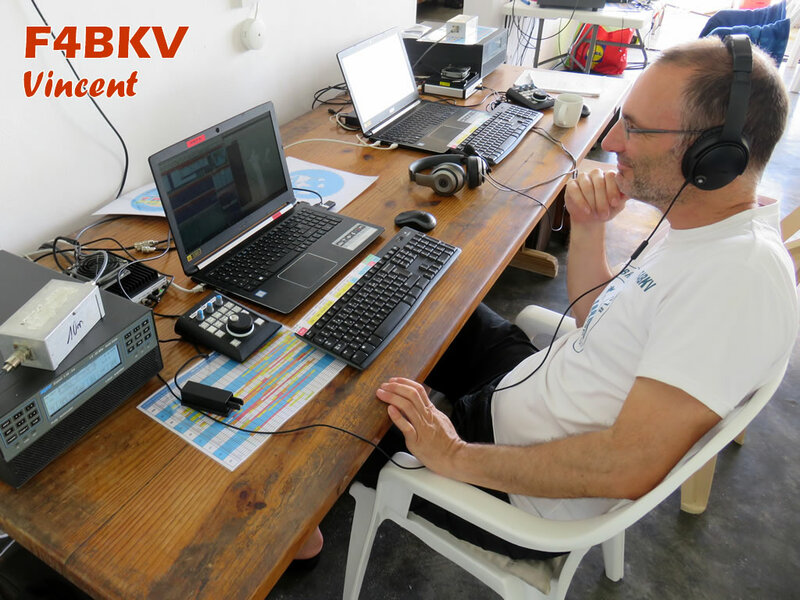 At 19h00 UTC we are close to the 55,000 QSO and we are more than ever motivated to push up to our goal ! The moral is still excellent in spite of the difficulties and tiredness. We want to give our maximum for this last week-end! The CW rate is higher than SSB, especially when the conditions are not very good. We do not hesitate to exploit most of the bands on CW to keep a good rate. As soon as the signals grew, we switch on SSB. The weekend is ideal to give a chance to all those whom did not have the opportunity to make a contact with us yet. Unfortunately, this Saturday evening the conditions are particularly bad. The 17m and 20m close suddenly rather early. 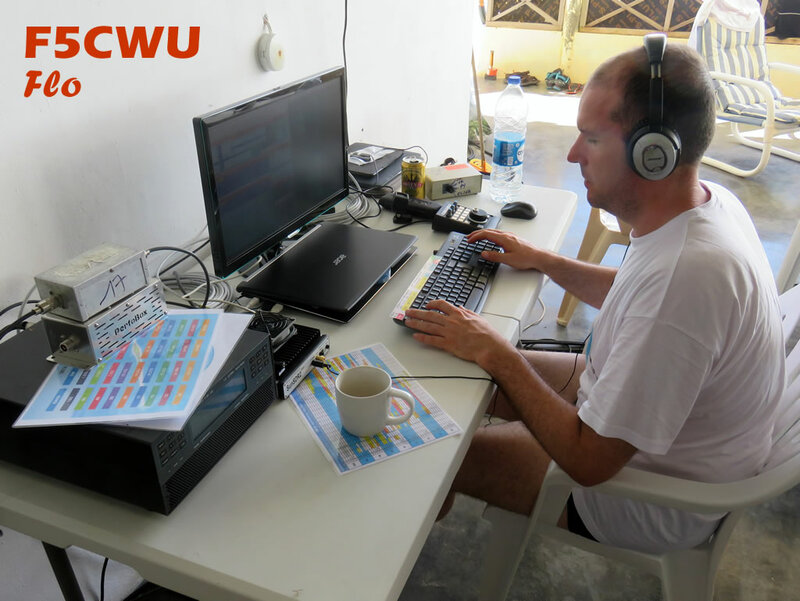 Sebastien F5UFX, Patrick F2DX, Florent F5CWU and Pascal F5PTM give their maximum in CW in spite of the disturbances and those which are calling obstinately whereas a QRX is asked. Some are obstinate, too! – We voluntarily leave rather broad Split so that the stations having small installations can contact us easily. It is often their only chance. – On SSB, much of frequencies between the decimal 0 and 5 are not used. At home, we have the feeling that there is stations calling everywhere but at the other end of the pile-up is sounds much different !Do not hesitate to use all the split range, not only by 5khz steps. – Sometimes, the rhythm dropped a little bit. This is because we were in search of small signals. Honestly, we can tell you that many have been logged because we saw the signal peak on the spectral visualization of the SDR. Not certain that using a classic VFO their signal would have been detected so easily. – To help the operators, please always call with your complete callsign instead of 2 ou 3 letters. It is a BIG waste of time and make the operators nervous and irritating ! – The requests of QRX to listen to a continent in particular are not made to annoy people ! 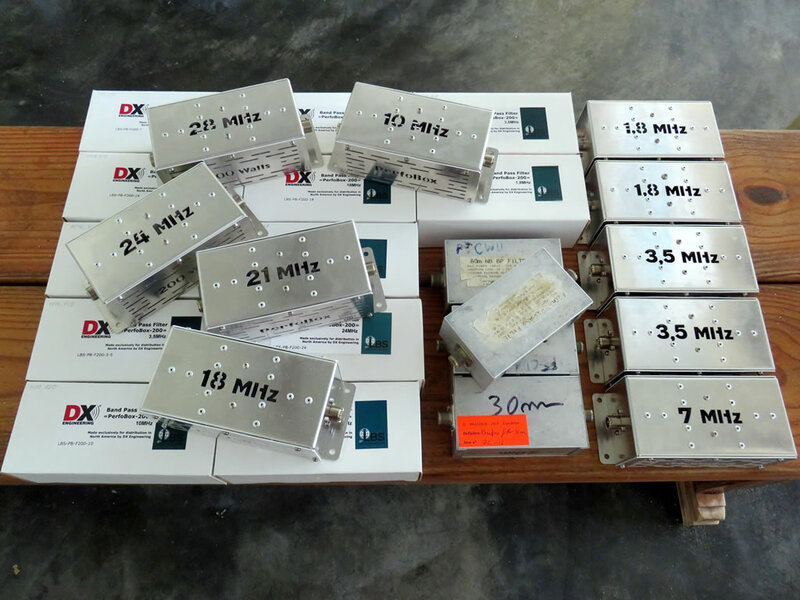 We understand that it can be frustrating to listen a station DX with large signals working other continents. But, that’s the game ! Certain zones of the world do not have the chance to hear us almost around the clock but have only a 1 or 2 hours propagation window ! Sorry if this windows happens when you are back from your work ! While some among us continue the traffic, others start disassembling the camp. 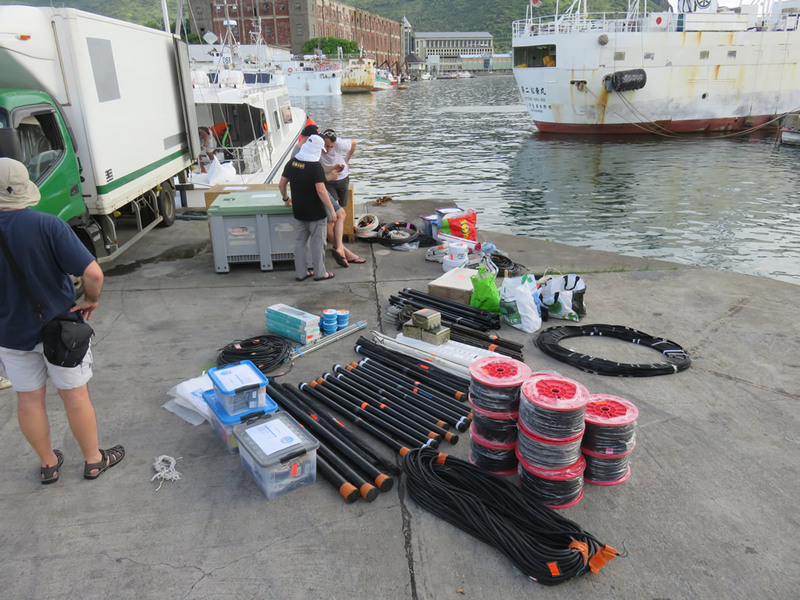 We keep only some antennas which will be used by the two operators who will leave two days later with the other boat. All the equipment must be arranged properly so that all can fit in the crates for the way back. Once at the harbor,we will not have time to recondition everything. In the evening we reached the 69,000QSO. We are going to try working the missing thousand on the last night. Propagation has been very bad during the last night and we have not been able to keep all stations on the air. This is the last day of the operation for most of the operators. Only F4FET Gil and F4HAU Diego will remain on the island. Our 6 friends leave the islands in the morning. Suddenly, a silence after 10 days of intensive activity ! The usual peace of this place re-appears and it is as pleasant as perturbing. However, our 6 friends entrusted us the mission to go beyond the 70,000 contacts and complete the logistical operations. So, it remains a lot of work for our two-persons team ! We sit down again at our radio stations to live our last moments on this IOTA lost right in the middle of the Indian Ocean. Contacted on 30m RTTY, PA0MDB will be our 71.158th and last QSO. We have a general feeling of relief, satisfaction and joy. All this adventure was carried out as a team, and what a team ! Once the crates transferred from the shore to the boat of the Raphaël Fishing, we leave St Brandon and head for Maurice. 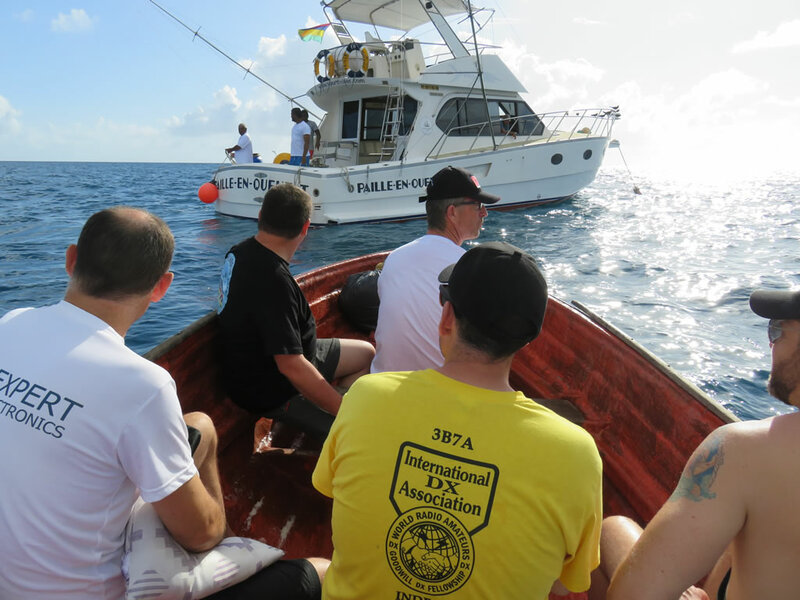 Let’s go for 26 hours of sea accompanied by a crew of fishermen, with a formed sea which, as with the outward journey, handle roughly our stomachs. We arrive at Port Louis at sunrise. All guys are awaiting us. Without wasting a second, we discharge the boat. Equipment is spread out on the gate and a last pointing is carried out to make sure that packing is in conformity with the documents of import/export. Lastly, we add lockers for air transport toward France and complete some documents for customs. We very sincerely make a point of thanking all our sponsors for their confidence and their fidelity! Although each operator finances his own sums of money his travel, his housing and an important part of the expenses related to the expedition, another significant part is covered by the sponsors, professionals, associations & clubs, and individuals. These supports are essential in this kind of adventure and we take our hat off to all those who have been involved in the adventure and made of this project a success. Thank you also at our pilot stations (F6AGM,N6PSE, JJ3PRT, LU5FF, ON9CFG), our families and friends who always answered present when we needed some help. On behalf of the team, I write these last words to greet and thank Sebastien F5UFX, FlorentF5CWU, Vincent F4BKV and Patrick F2DX for their remarkable work so that this project becomes a reality. I would like to thank the rest for the team made up of Pascal F5PTM, Laurent F8ATM, Gil F4FET and obviously in support Michel F6AGM and Jacques F6BEE. I appreciate this team, a small and true family. For sure those guys are more than simple friends. Thank you for these good moments in this so peaceful place and for the attention that each one carries to the others. Only one question remains since our return in France …this cohesion and this desire of going always further, over our own limits… where will it carry us the next time?